Chevrolet Captiva, the 7-seat SUV perfect for city life. It comes with a spacious cabin offering comfort for 7 passengers with flexible seating and plenty of luggage room. Whether on the weekday work run, shopping or going to the gym, it has the agility to handle city streets, the suburban commute or vacation weekends. The Captiva has unique styling with 2 new body colors; Abalone White Metallic and Black Meet Kettle Metallic. The Chevrolet Captiva introduces the new Chevrolet MyLink, our exclusive infotainment system which allows you to stream your favorite songs, get directions and access your contacts simply by connecting your smartphone via USB or Bluetooth. Every drive is made simpler thanks to an infotainment system that gives you a smart and easy way to integrate your smartphone with your car through Apple CarPlay. Access your favorite apps and other features by voice command via Siri, with dials located on the steering wheel or through the 7-inch high-resolution color touch-screen display. Whether prowling the city streets or exploring uncharted territory, the Captiva cuts a fine figure. Its athletic silhouette is given an elegant aspect by the flowing lines which begin at the chrome dual-port grille and run smoothly past the two-tone, 19-inch alloy wheels, all the way to the LED-studded rear lights. Its carefully crafted design is made all the more dazzling by the addition of Projector Headlamps which are teamed with LED daytime running lights to ensure that your presence never comes as a surprise to other road users. Your safety is further enhanced by Captiva’s Rear View Camera which includes Dynamic Guideline technology to show you the true distance of objects in your path when reversing. The new Auto Projector Headlamps, which turn on automatically in low ambient light, include low-profile LED Daytime Running Lights. The redesigned dual-port grille is framed by an elegant chrome trim and proudly features Chevrolet’s classic gold bow-tie logo. 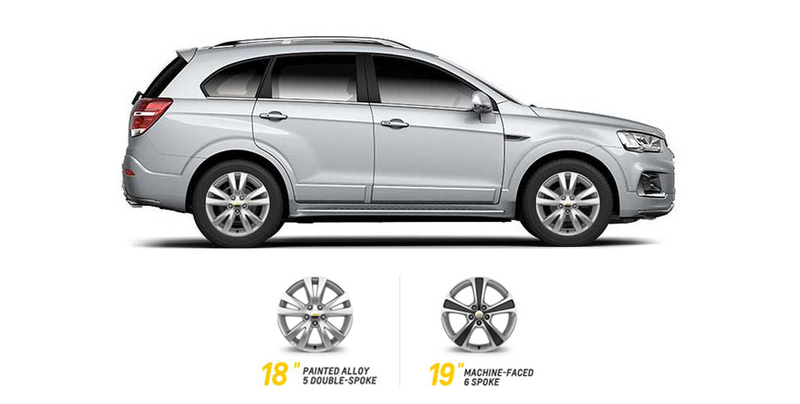 Sporty and durable 19-inch Two-tone alloy wheels allude to the power that lies under the hood. High-performance dual exhaust pipes High-performance dual exhaust pipes sit alongside the Rear Park Assist sensors. Sporty LED-studded taillights Sporty LED-studded taillights gracefully follow the Captiva’s aerodynamic contours. The Captiva’s spacious cabin brings together advanced technology and luxurious detailing to create a supremely comfortable and connected environment. With leather seats arranged in a 5+2 formation and a Piano Black center console containing a MyLink infotainment system – allowing for smartphone connectivity through Apple Carplay. You can customize your driving experience to make every journey truly captivating. The strength of the new Captiva doesn’t just lie in its stylish exterior and amazing horsepower. 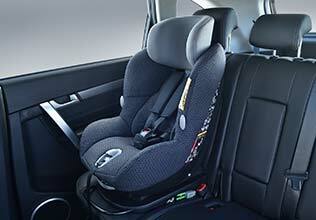 Captiva’s comprehensive and innovative safety features are designed to let you feel confident on every journey. With an array of safety technology such as Hill Descent Control, Side Blind Zone Alert and Electronic Stability Control system. Using radar sensors, Rear Cross Traffic Alert warns the driver of vehicles in traffic when reversing out of a parking spot – including angled parking. Visual and audible alerts are triggered if moving vehicles are detected. Drive with peace of mind in every situation with 8 safety systems that work together to optimize balance, control and safety. ESC prevents your Chevrolet from skidding out of control by applying brake pressure to the wheels that need it and by limiting engine power, when necessary. When traction on the road surface is lost, TCS acts to regain control. 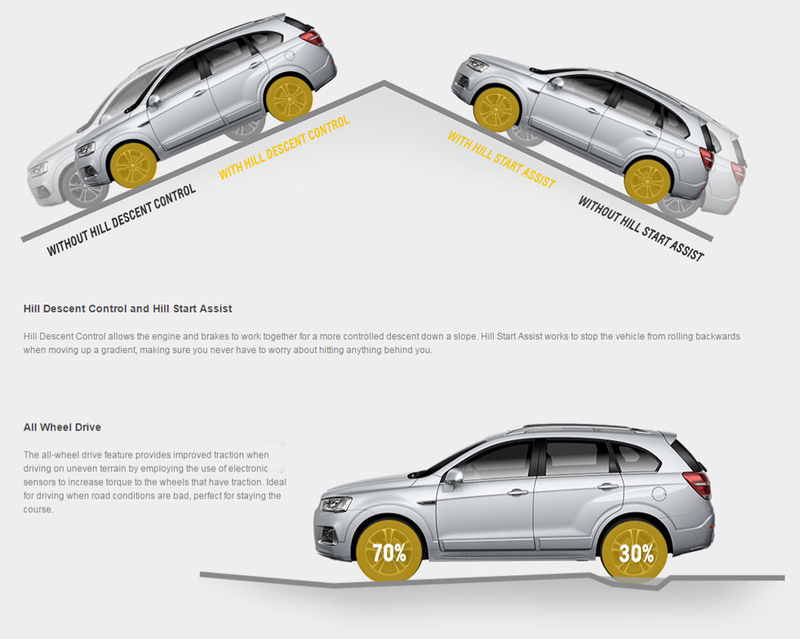 EBD automatically calculates and applies the correct amount of braking pressure to each wheel to maximize stopping power and maintain control when braking. 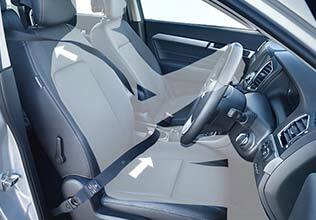 The Captiva features side-curtain airbags, Double SRS front airbags and a high strength body frame for enhanced safety. 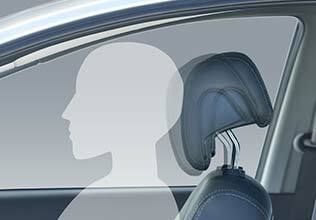 The active headrest aims to reduce impact to the neck by minimizing excessive rearward movement of the head in a rear-end collision. It works by using the force to the occupants body against the seatback to move the head restraint forward instantaneously supporting the head to protect the neck of any occupant on board.